The design of the Bonfiglioli worm gearbox has been improved with higher torque ratings. A tough little gearbox that began its working life nearly 20 years ago in France has begun a new career at the heart of a versatile confectionary packaging machine half a world away in Australia. 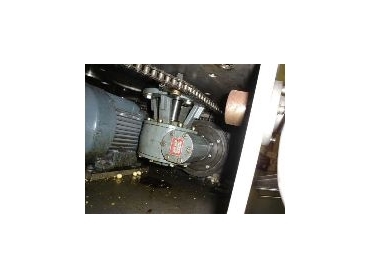 Pausing only for an oil change, the Bonfiglioli multipurpose worm gearbox has been incorporated as the main drive of a customised continuous motion vertical cartoner engineered by John A L Mills and Associates. The Melbourne precision metal working specialists found the Bonfiglioli VF62F drive (since superseded by Bonfiglioli's later W models) was in such good condition after its years of service that it would run with perfect reliability in the Marchesini machine being modified for contract packaging. "The drive was originally transferred out to Australia in a BAV 120 Marchesini used first for packing cosmetics in France in 1987, then later in a similar role in Australia, before being used for pharmaceuticals," says John A L Mills’ Managing Director, John Mills. "After a period of inactivity, the Marchesini was presented to us for refurbishment to run at 'as new’ speeds for confectionary packaging, but with features that made it better than new. “The high-speed conveyor transfer section features wide mouth loading hopper apertures descending into contoured exits for high speed (90 cartons a minute) precision filling of 30g confectionary cartons," said Mr Mills, whose previous projects have included precision equipment for such demanding applications as defence, food and beverage, laboratory, pharmaceutical and scientific. During testing of the previously inactive Marchesini machine, Mr Mills ran the motor up to full speed to see what happened. "The output shaft of the Bonfiglioli worm box turned, but little more. So the machine was stripped and all worn parts were replaced,” he said. "The Bonfiglioli gearbox was inspected as part of this process, and found to be in mint conditions. A change of oil was all that was needed for it to go back into service." The original VF62F series gearbox - now functioning flawlessly in its new role - was the predecessor of a multipurpose series of Bonfiglioli drives available throughout Australasia, including the latest W versions in models from 190-1,000Nm. Bonfiglioli Transmission (Australia) Pty Ltd Managing Director Malcolm Lewis said that while Bonfiglioli's versatile worm gearboxes are among the smallest in a broad range extending up to giants with more than 55,000 Nm of torque, they have always been a market leader in their intended role. "There are thousands of these worm gearboxes out there still performing flawlessly after years and decades of service, in Australia, New Zealand and worldwide," he said. "The design has been improved with higher torque ratings, better mounting and changeover flexibility, plus enhanced thermal ratings to permit more compact units to be selected for many applications. "But the rugged heart of the drive retains the same quality and durability that has made this type of drive a market leader over many years." Bonfiglioli Transmission (Australia) Pty Ltd is part of the international Bonfiglioli group with worldwide sales of more than $A550 million a year and which employs more than 1700 people. The Australian operation is complemented by a network of distributors extending throughout the country and in New Zealand includes Precision Bearings and Transmission and Saeco Bearings and Transmissions. Bonfiglioli's flexible modular ranges extend across the performance spectrum from smaller W1 worm models right through to the larger and sophisticated combinations of C1, A, F and S helical and helical bevel products, as well as clutch-brake units and electric brake motors. The range includes versatile Trasmital planetary units as well as heavy duty TA, RAN and RAP/RAO types up to 55,000 Nm outputs.